Franklin Delano Roosevelt was born on January 30, 1882 at his parents' estate in Hyde Park, New York. His parents were members of the New York aristocracy. His father, James, was a country gentleman who made money in railroads and coal. His mother, Sara, was a strong-willed woman who adored her only child and remained a central figure in his life until her death in 1941. His father died in 1900. FDR�s childhood in Hyde Park instilled in him a love of the Hudson Valley, farming and rural people. His lifelong interest in forestry helped shape some of the policies and programs of the New Deal, particularly the Civilian Conservation Corps (CCC). After being educated at home by private tutors, FDR entered Groton, an elite private school in Massachusetts, in 1896. Endicott Peabody, the head of the school, became an important influence in FDR�s life instilling in him a strong sense of civic responsibility. One of the most significant events while he was at Groton was a talk given by his distant cousin, Theodore Roosevelt, whom he greatly admired and went on to emulate in his political career. FDR was neither an outstanding student nor athlete, but he entered enthusiastically into life at Groton and did well enough to go on to Harvard in 1900. At Harvard he put much of his energy into his social life and extracurricular activities. His greatest accomplishment was to become president of the Harvard Crimson, the campus newspaper. FDR was a handsome, charming, fun-loving young man to whom women were strongly attracted. In 1902, he began to take notice of Eleanor Roosevelt, Theodore�s niece and FDR�s distant cousin, whom he had seen occasionally during his childhood but who was now a tall, willowy, intelligent young woman. They fell in love and, after a year�s delay granted to his resistant mother, were married in New York City on St. Patrick�s Day, 1905. Her father being dead, President Theodore Roosevelt gave his niece away. Despite the later difficulties in their marriage, FDR had chosen well and ER and FDR remained committed partners throughout their lives. After their honeymoon in Europe, FDR and ER moved into one half of a double townhouse given to them as a wedding present. Sara occupied the other half, which opened into theirs. FDR resumed his studies at Columbia University Law School, which he had begun in the fall of 1904. He never completed the courses needed to receive an LL.B. degree, but passed the bar examination at the end of three years and began a law practice in New York City. In 1910, FDR won a seat in the New York State Senate. It would be the only election in which he carried the Republican stronghold of Dutchess County where his Hyde Park home was located. As a freshman senator, he led a challenge to the Tammany bosses who sought to elect one of their own to the United States Senate (senators from New York were at that time elected by the state legislature). Although the uprising failed in the end, FDR won wide renown for his efforts. He introduced legislation to protect farmers that successfully passed and headed the Senate Forest, Fish and Game Committee where he began to emerge as a leader in conservation. After the election of Woodrow Wilson in 1912, FDR accepted an appointment as assistant secretary of the navy, a post he held for the next seven years. A lover and student of the sea and ships from his childhood on, FDR vigorously argued within the administration for a better prepared navy and for a more militant stance in crises than Wilson was willing to take. When the United States finally entered World War I in 1917, FDR worked to ensure that the navy had a vital role to play in the war. In the making of peace at the end of the war, FDR absorbed President Wilson�s internationalist ideals, as well as the lessons of Wilson�s failure to bring the United States into the League of Nations. His experience during this period helped produce the combination of idealism and realism that he later brought to the creation of the United Nations. Franklin and Eleanor Roosevelt�s first child, Anna, was born in 1906. Five sons followed (one of whom died in infancy), the last of whom was born in 1916. The large family spent vacations in Hyde Park and part of each summer on the island of Campobello on the Canadian coast just north of Maine. In the fall of 1918, ER discovered that FDR was having a love affair with Lucy Mercer, a beautiful young woman who served as ER�s social secretary. ER offered FDR a divorce, but partly because divorce was considered a disgrace in their social circle and partly because it would have badly damaged his political career, FDR decided to stay married and agreed never to see Lucy again. The incident profoundly altered their relationship and was a major factor in ER�s search for friendship and fulfillment in social and political activism independent of FDR. In 1920, FDR was nominated as the Democratic candidate for vice-president on a ticket with James Cox of Ohio. Although they did not win, FDR�s spirited campaigning won him a following in the Democratic party and laid the groundwork for his future success. He returned to his law practice with a promising political future ahead of him, but in August of 1921 at the age of 39, he came down with polio while vacationing at his beloved Campobello. Paralyzed from the waist down, he set about trying to recover the use of his legs with characteristic energy, optimism, ingenuity, and determination. He began an ambitious regimen of exercise and searched out new treatments. Although he increased his strength, particularly in his upper body, he would never walk unaided again. In 1924, he discovered the restorative powers of the mineral waters at Warm Springs, Georgia, and found that exercising in the buoyant 88-degree waters there helped him recover some sensation and muscle strength. Not content with trying to heal himself alone, he bought the old resort hotel at Warm Springs and in 1927 established the Warm Springs Foundation, a pioneering center for the rehabilitation of polio patients and for what is called today, �independent living.� He remained devoted to this institution for the rest of his life, returning almost every year to celebrate Thanksgiving with his fellow �polios� and at other times to restore his body and spirit. While FDR sought to recover the use of his legs, he remained active, mainly through correspondence, in the Democratic party. Louis Howe, the canny political operative who attached himself to FDR when FDR was a state senator, worked tirelessly to maintain FDR�s profile in the party. In 1924, FDR appeared at the Democratic convention on crutches to nominate New York Governor Al Smith for president. Although Smith did not win the nomination, FDR won acclaim for his speech. Howe also became a valuable advisor to ER in her work in organizing the Women�s Division of the Democratic party and ER�s growing power and influence also helped keep FDR�s name alive. In 1928, when Al Smith won the Democratic nomination for president, he persuaded FDR to run for governor of New York. Although Smith lost, FDR won. FDR established himself as a progressive governor by bringing tax relief to farmers and advocating cheap electric power. In September 1929, the stock market crashed and FDR spent the rest of his four years as governor dealing with the consequences. He moved slowly at first but as the depression worsened, he became a strong advocate of government intervention. He established relief programs for people out of work, including a program that put 10,000 men to work in New York State�s forests and parks planting trees, building roads and park buildings, and taking measures to prevent erosion. This would become the model for the CCC, one of the most successful New Deal programs. In 1932, with the Great Depression at its peak and Herbert Hoover, the incumbent president, unable to effect change or inspire hope, the American people elected FDR president by a wide margin. He brought to the presidency the courage that had enabled him to overcome his disability, the experience that he had acquired in fighting the depression as governor, a joy in exercising the wiles of a skillful politician, and an incandescent optimism that lifted the spirits of the nation. With a strong mandate, FDR moved quickly during the first hundred days of his administration to address the problems created by the Great Depression. Under his leadership, Congress passed a series of landmark bills that created a more active role for the federal government in the economy and in people�s lives. During the first hundred days of his administration, Congress passed the Emergency Banking Relief Act, which stabilized the nation�s ailing banks and reassured depositors, created the Federal Emergency Relief Administration (FERA), the National Recovery Administration (NRA), the Agricultural Adjustment Administration (AAA), and the Tennessee Valley Authority (TVA). Believing that work programs were better than relief, FDR secured passage of legislation establishing the CCC and the Civil Works Administration (replaced in 1935 by the Works Progress Administration or WPA). He appointed Frances Perkins as Secretary of Labor, the first woman to become a cabinet member. With strong prodding from Eleanor Roosevelt, FDR appointed more women to federal posts than any president before him and made sure that black Americans were included in federal job programs (although they remained, in most cases, segregated). In 1935, Congress passed the Social Security Act, the most important and enduring piece of New Deal legislation. On March 12, 1933, shortly after his inauguration, FDR gave the first of his famous �fireside chats.� In these informal, but carefully prepared, radio talks, FDR explained his initiatives in the same language he used in speaking with his rural Hyde Park neighbors. As a result, his listeners felt that he was talking directly to them, understood their problems, and was taking action to address their needs. FDR�s ability to connect personally with ordinary people, to communicate his optimism, and project an image of vigorous action was probably as important as all the New Deal legislation combined in helping the nation weather the Great Depression. Although the depression was far from over, New Deal legislation during FDR�s first term in banking, housing, unemployment, work relief, and old age pensions gave people hope and a sense of security they had not enjoyed before. In 1936, FDR won reelection in a landslide even bigger than in 1932, carrying every state except Maine and Vermont. During his first administration, several key pieces of New Deal Legislation, notably the NRA, had been struck down as unconstitutional by the Supreme Court. Frustrated that the aging members of the Court were preventing some of his programs from taking effect, and feeling that his 1936 victory gave him an overwhelming mandate for change, FDR proposed expanding the number of justices on the Court. Many Americans, however, saw the "court packing� plan as an assault on one of the nation�s sacred institutions. The plan immediately ran into stiff opposition in Congress and was defeated, handing FDR the most embarrassing political setback of his career. By 1937, the depression had eased somewhat and FDR sought to balance the budget by cutting government spending. But in the fall and winter of 1937-38, conditions worsened again, partly because of these cuts, and FDR had to seek additional funds to meet the crisis. The depression didn�t actually end until the beginning of World War II when the defense economy put the unemployed who were not called to military service back to work. The United States finally entered the war when Japan attacked Pearl Harbor on December 7, 1941. FDR�s eloquence, confidence, love of action, and ability to communicate with ordinary people made him one of the great leaders of a nation at war. His abiding interest in naval ships and strategy and experience as assistant secretary of the Navy helped him form a close working relationship with his military commanders. In December 1942, with many on the West Coast panicky about possible Japanese subversion or invasion, FDR signed an executive order authorizing the internment of Japanese living on the West Coast, many of whom were American citizens. As the war progressed and news of the Holocaust became more and more disturbing, pressure grew to address the urgent needs of refugees. In January 1944, FDR issued an executive order establishing the War Refugee Board, which aided in the rescuing of Jews and other refugees during the remainder of the war. In 1944, the tide turned, but the war was not won. FDR ran again and won a fourth term. Unknown to the public and apparently not fully recognized by himself, he was already seriously ill. Nevertheless, he was determined to see the war through to its conclusion. After his return from Yalta, the last of the wartime conferences with Allied leaders that he attended, he grew worse and, on April 12, 1945, died of a cerebral hemorrhage while trying to recover his strength at the Little White House in Warm Springs, Georgia. He was buried in Hyde Park. From the early 1920s on, FDR and ER managed a complex relationship with each other. Although their circles of friends overlapped, they rarely relaxed together. FDR and ER each found emotional sustenance in other people, not in each other. FDR found affection, humor, and fellowship in his friendships with Louis Howe, Harry Hopkins, Edwin �Pa� Watson (his military aide and appointments secretary), Missy LeHand (his devoted personal secretary), Margaret �Daisy� Suckley (a distant cousin), and, during World War II, with the exiled Princess Martha of Norway and his daughter Anna, who moved into the White House in 1943. FDR and ER continued, however, to have great respect and affection for each other. Without this they could not have created one of the greatest political partnerships in history. ER�s strong support among blacks, women, and youth and her skill at political organizing helped draw support to FDR. Her first-hand knowledge of conditions and government programs, which she gathered on her frequent travels, helped her shape some of the policies of the Roosevelt administration. Although her independent stance on some issues may have been a liability to FDR, it also meant that blacks, women and youth felt that someone with power and influence understood their problems and was fighting their fight within the administration. Freidel, Frank. Franklin D. Roosevelt: A Rendezvous with Destiny. Boston: Little Brown and Co., 1990, passim. Graham, Otis L., Jr., and Meghan Robinson Wander. Franklin D. Roosevelt, His Life and Times. New York: Da Capo Press, 1985, passim. 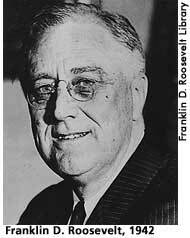 Leuchtenberg, William E. The FDR Years: On Roosevelt and His Legacy. New York: Columbia University Press, 1995, passim.